You are currently browsing the The Pet Product Guru blog archives for the day Tuesday, September 10th, 2013. The experts recommend that you take your cat to the vet twice per year for a physical exam and an evaluation of any special health needs that he may need. This of course is if he is in generally good health and has no underlying medical conditions. Twice a year may sound like a lot but cats have small bodies and they change faster than ours with age. Cats hide their symptoms until they pass through much of the onset of the problem. Some cats are obese and they can develop diabetes, some vomit excessively and some cats develop dental disease. All of these conditions are serious and your cat may not show any symptoms at first. This is the reason to make sure that your vet sees him at least two times per year. As a cat moves into their senior years, they will all develop renal failure and 30% will develop hyperthyroidism. 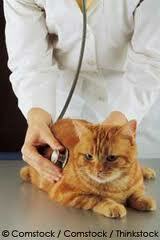 Keep your cat up to date on his checkups and you’ll have him around for a long time! We invite you to listen to some great music on THE EDGEWATER INTERNET RADIO NETWORK! Soft Rock, Oldies, Dance, Popular standards, Country and Alternative/Classic Rock. A great selection for our great audience!